Amazon China revealed the new Kindle Oasis earlier today and many people were unsure if the screenshots were legitimate or not. 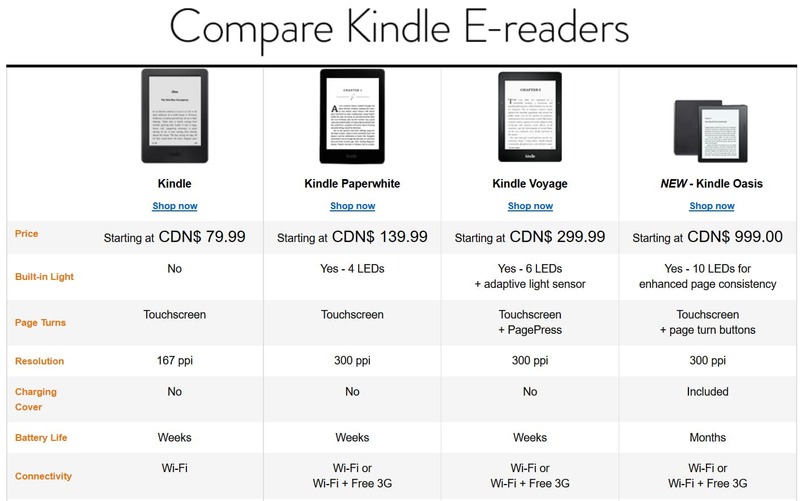 Apparently they are, since Amazon.ca has just posted a comparison between the Kindle Paperwhite, Kindle Basic, Kindle Voyage and the new Kindle Oasis. The Kindle Oasis will be six inches and have a 300 PPI screen and will have a battery that will last 20 months in standby mode. Additionally, there will be 10 LED lights that will allow you to read at night. The Kindle Voyage has 6 LED lights, while the Paperwhite has 4. It will be interesting to see if the new Oasis screen will be notably brighter with the additional LED lights. What completely boggles my mind is that the Kindle Oasis says its going to retail for $999 Canadian. Who knows if this will be the price or not, or if someone at Amazon screwed up on the product listing. I am betting the $999.00 is just a placeholder for the real price when it debuts. Obviously not $1000. I still really hope that’s not the product. if you search Amazon.ca for the Kindle Voyage it costs 699. I just did a look up on Amazon Canada and the posted price in Canadian currency is $299.00 not $699.00 for the Voyage. I hope this information on the Kindle Oasis is wrong or incomplete. For me the information is a let down. No, they most certainly will not pay 999, whether it is priced like that or not. But obviously it won’t be. There is a price point at which I would buy this device, but it’s probably lower than what the Voyage currently sells for. I’m hoping for a sale on Voyage, and not just for prime members. I guess the price for Canada is $499, (probably not solar powered) case included. It’s $289.00 USD. Which is just ridiculous. Just buying a new kindle every time you get yours wet or ran out of batteries would be cheaper. It’s priced at about 23,999 indian rupees at Amazon India that’s about 360 USD, it does comes with a rechargable leather cover. The pre-orders are already up. Real price not so far off… lol. What a joke! BTW, I visited some other sites discussions and they are all saying the same thing– “&@$! No!”. no big improvement… not worth more than CAD 250. Bigger screen and pdf support would have been much more useful than futile bs like buttons to turn pages or extra battery, or extra leds. I use paperwhite 1 and the screen is milky dazzlingly white to the max intensity and… whiter than may new spare paperwhite 3.